Alagar Koil is one of the 108 divya desam temples situated at a distance of 21 km from Madurai, on foot of Alagar hills. Lord Vishnu resides as Azhagar ( the one who is beautiful), brother of Meenakshi. This temple is famous for its beautiful sculptures and exquisite 'mandapams'. According to Hindu Mythology, Lord Vishnu came to this place from his heavenly abode to give away his sister Goddess Meenakshi (Parvathi) in marriage to Lord Sundareswarer (Shiva). The grand main tower at the entrance is believed to have been built by the Pandya Kings. According to the historical scriptures, Malayadhwaja Pandyan, son of Kulasekhara Pandyan, was the earliest known monarch to patronize the temple. Sundara Pandyan beautified the 'vimana' of the shrine with gold plates. After the Pandyas rule, the Nayakas patronized the deity. It is said that Lord Yamadharmaraja, daily comes to this sthalam in the night to worship the Perumal. The Perumal is also named as "Paramaswamy" . The main deity of this temple is called Alagar, Maliruncholai Nambi and the utsavar (processional idol) is called Alagar or Sundararajan. The stunning idol is made of gold and silver and is an exquisite example of South's craftsmanship. Both the Moolavar and utsavar are found along with the Panja Aayutham (5 weapons) namely the Sangu, Chakkaram,Sword, bow and Gadha, in their hands. 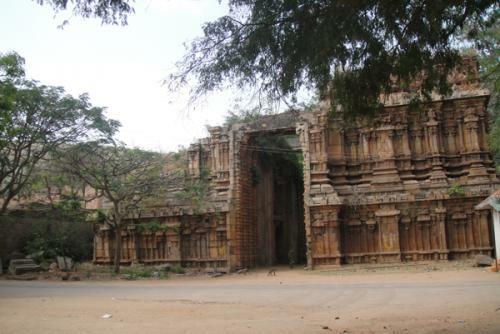 There is a shrine for Kalyana Sundaravalli, the divine consort of Alagar, in the southern enclosure. There is another shrine in the north dedicated to Andal,Sundaravalli Nachiyar also known as SriDevi. Other important shrines are of Sudarshanar and Yoga Narasimhar. Vairavar, who is the "Shetra Balagar" of this sthalam (God of the temple) is said to be the powerful. There is another shrine nearby, dedicated to village God Karuppannaswamy, the God of the local tribals,Kallars. There are finely carved eighteen steps, which are worshipped by the devotees. It is nowadays closed and you should enter via the North gopuram. The place is also known for its holy springs called Silambaru and Noopura Gangai. According to local folklore, these springs originated from the anklets of Maha Vishnu during His incarnation as Trivikrama. Thayar of this sthalam is Alarmelmangai thayar. Mangalasasanams The temple is revered by the verses of Tirumangai azhwar ,Ramanujar, Manavala Mamuni, Periazhwar,Andal,Boothathazhwar,Peiazhwar and Nammazhwar. Sthala Viruksham ( Temple tree) Sandhana Maram (Sandal wood tree). Trivia The speciality of this sthalam is that the devotees are given the Vibhoodi (Thiruneeru) which is not the practice in Sri Vaishnava temples but given only in Saivates temples. Every year during the Tamil month of Chithirai(Chaitra month) on full moon day, Chithirai Thiruvizha is celebrated. Chithirai Thiruvizha is about Azhagar's Sister Meenakshi's marriage. During the festival, wedding ceremony of Goddess Meenakshi and Lord Sundareswarer takes place and Lord Azhagar travels to Madurai. 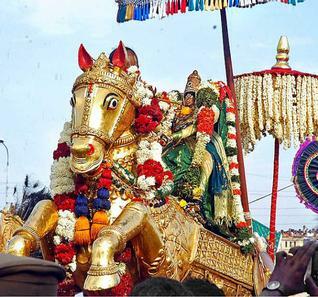 A gold processional idol of Azhagar, called Sundararajar, is carried in procession by the devotees from Alagar Koil to Madurai for the divine wedding ritual. In the month long festival the first 15 days is about Meenakshi and her marriage and next 15 days is about Azhagar. The festival culminates in the main event of Kallazhakar (Azhagar) Crossing the Vaigai river. Thousands of people gather near the Vaigai river to watch this event. It is a tradition for the people of Madurai to welcome Alagar. 1)Madurai is well connected by Air,Rail and road. Alagarkoil is just 20 kms away. Lots of local town buses ply to this place. Auto rickshaws, taxis are also available from anywhere in Madurai. You have to negotiate before hand for the return fare. Where to eat? Variety of food available in various restaurants in Madurai. Madurai is known for the roadside idly shops that are open through the night. Other interesting places around Alagarkoil Pazhamudir Cholai,One of Murugan's arupadai veedu is nearby on the Alagar hills.